I have returned home from four days of meeting and fund raising dinner for the United Religions Initiative and have finally had a moment to think about what it is I wish to convey to you regarding this rather momentous event. I am certainly tired to the bone, having stayed up every evening until around one in the morning while Don worked on his more detailed reports to you. The wall at the head of my bed was thin enough to allow me to share the snores of a fellow attendee in the next room and the blanket insisted on slipping off of me during the night so that I awoke several times, cold and tangled in sheets. Don and I joked that our early morning spiritual meditative practice was to study the insides of our eyelids until only enough time remained to rise, dress, and hurry to breakfast each morning at eight am. For others the meditative drive to Peet's Coffee filled their morning spiritual needs. After breakfast beginning at nine am we worked until eleven thirty every morning, and following a brief bio break and snack, were back at it until lunch at one pm. We returned to work at two, broke at four for about ten minutes and back to work once more until dinner at seven PM. These were very long days but we had so much business to take care of that the time passed rapidly.We were always behind schedule as well. The meals were very interesting. Lunch and dinner were little varied during the four days. Lintels provided a major source of protein (generally in the form of a soup) while steamed veggies, a starch and salad filled out the menu. All of it vegetarian, and most of it vegan, was grown on site and all of it was fresh and well prepared. The Brahma Kumaris believe that intent in food prep is essential to the process and that intent was clear as you watched the concentration in their service of the food for you with love and devotion to service. They believe that the food should not inflame the passions (this includes, I suspect, the unnecessary passion for food) and so while their food is well prepared and flavorful, it is not particularly full of variety or excitement. For the longest time Don and I could not figure out what they had against ice until it occurred to me that they had no freezer on site. You had the choice of tepid, filtered water from the tap or hot tea. Thus the regular morning pilgrimage to Peet's Coffee. On Friday, after our Cooperative Circle Report on the Think Peace Media and Communications CC I decided that we should walk our talk and called your National Public Information Officer (who happens to be married to me poor dear) and my son to bring over the lights, camera, and portable sound studio and had them help me set up a recording area where I began to capture the stories of the attending members. These stories will be available to you as soon as I can get them edited so please be patient. I am still working on the tapes from the Parliament which will continue to make themselves available to you throughout this year on this site. The URI's yearly fund raising dinner, Circles of Light, was held on Saturday evening and I volunteered to take Mussi and Vrajapati with me. Mussi quizzed me about the practice of the Craft for the entire forty-five minute drive and I was as honest and as straight forward as possible not soft peddling our practices in any way. He was remarkably receptive and astute in his questions. This conversation segued into a discussion of the Golden Rule ( a CC that he founded) and the fact that as Witches we have no real equivalent. I discussed the Rede and the meaning of "will." He had been certain that a search of the "scriptures" of every religion would reveal some form of the "Golden Rule" philosophy. Then of course, I had to explain that we don't have scriptures. He was really confused by that one though I think that eventually he understood that we are really an orally transmitted tradition with minimal exceptions. After four three days of the same vegetarian meal six times, we dove into the chicken like it was fillet minon. The new ten minute ad for the URI was, Don and I agree, the best effort yet and we were pleased to see our religious tradition represented in two or three of the pictures in both symbols and Don's presence. They also used a couple of my photos so we were well pleased, though come to think of it I don't know whether I received credit. By the end of it however Vrajapati and I were more than ready to go. Unfortunately everyone wished to be seen with Mussi and for every step that we took toward the door we ended up stepping back two. If I got anywhere near the "photo op" I was hauled into the picture as well totally defeating my efforts at affecting our escape. We did manage to move steadily toward the door and finally Vrajapati threw his arms around Mussi as if to hug him, (along with everyone else that evening) and then jokingly wrestled him physically toward the door. As you can see the size difference somewhat in the pics below you will have little trouble imagining how funny that was as Vrajapait is about half of Mussi. The two of them were laughing so hard that everyone relented and let us make our escape. Even at that we were pretty much the last to leave. Vrajapati kept chanting "don't look back...don't look back". The poor young man was asleep in the back of the car before we were out of the city. Mussi Hailu is the person about whom Don tells the Habibe story. He is the young man on the far right of the picture below. Next to him is Audri Scott Williams, who spent four years walking six continents for her project "Trail of Dreams". Next to her, with the flaming red hair is Ardey Turner, current director of the North American Region, and at the far left is Biswadeb Charaborty, a most remarkable young man indeed. You will hear their stories from them in the tapes as I edit them. Here we are surrounded by our work, with charts covering all of the available wall space. ( We are nothing if not visually oriented) Yoland Trevino, Chair of the URI Global Council, is on your left. Salley Mahi (whose name may be mis-spelled here), URI staff, Lance Trumbull, our Regional Coordinator is next, Mathew Youde, one of our Global Trustees and the youngest member of this meeting (as well as the Global Council in general at the age of 22), followed by the newest member of our region, Bobby Jo Free. Bobby Jo Free is a clothing designer who started making dolls out of scraps of material as a healing process for the members of her family. Each doll has a story and we took turns holding them during the meeting, (I have no idea why). Here Vrajapati has one on his lap as we discuss alternative names for our region. At one point in the discussions Vrajapati, meaning to say "bumblbee" said instead, "humblebee" and we jokingly put forth the name of Humblebee Region. The flag you see behind him was designed by Nicholas Roerich. In 1949, during the forth session of the general UNESCO conference, a decision was made to develop international law regulating cultural heritage sites and to see to their protection in case of armed conflict. It has since been widely accepted one international symbol of peace. 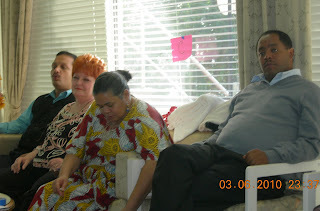 While Yoland (Mayan / US) was up and leading morning meditation in the Meditation Room at 43:00am, most of us slept in and, after a light breakfast, started the meeting at 9:00am. Vajrapati & Biswadeb (both Hindu / India) opened leading is in a chant of “Om Namo Bhagavate Vasudevaya”, while Deborah Moldow (interfaith / US) lit the candles on the altar we had assembled yesterday. The altar started out as my traveling altar, with Elements in the directions and images of Thoth & Hekate, but each person added their own sacred images and objects as they arrived. It also has a stone that I carry with me from the well of Coventina, the tutelary deity of the Covenant of the Goddess. Matthew Youde (Catholic / Wales), one of the three URI Trustees elected by the Multiregion, led us all in reading the URI’s Charter. 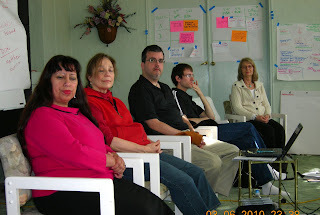 Yoland led us in a small-group exercise imagining the future of the Multiregion. I said that “The Multiregion IS the URI.” We make the connections between people of common cause and interest around the world. After a quick break to take a group Multiregion photo, we started presentations from each of the Cooperation Circles’ (CCs) present about their activities. • Ardey Turner (Christian / US) said that the Circle of Healers CC (circleofhealers.com) prays and offers spiritual healing for all of us in the URI every day. • Lance Trumbull (interfaith / US) of the Everest Peace Project CC (www.EverestPeaceProject.org) told an abbreviated version of climbing Mt. Everest. • Linda Bennet Elder (Christian / US), another Multiregion Trustee, told us about the Pilgrimage Project CC which brings together academics from different faiths. o Expressing the URI in Music & the Arts CC created an Interfaith Songbook which is available online (www.interfaith-presidio.org/store/songbook.html) and is now involved in creating an Interfaith Choir at the Interfaith Center at the Presidio. We held the Interfaith Sacred Space Design Competition, published a book and documentary about the results, put them online (at www.interfaithdesign.org), and are applying what we learned to the redesign of the ICP Chapel (www.interfaith-presidio.org). We are creating an interfaith cooking program featuring the traditional dishes associated with upcoming religious holidays. o The Indigenous MCC, linking CCs in Latin & North America (so far) with a common interest in indigenous spirituality. In this context, our tribal brothers and sisters in the Iniciativa Indigena Global in Latin America consider Wiccans to be indigenous practitioners. • Vajarapati (Hindu / India) told how the TD Singh Science & Spirituality CC (www.urimulti.org/index.php/cooperation-circles/multi-td-singh.html) has organized several conferences on the subject of science & religion. • PK McCary (Lutheran / US and Rachael Watcher (Wiccan / US) explained how the Think Peace Media & Communication CC (www.thinkpeaceradio.net/) has been collecting the stories of the average URI members, to make the heart-to-heart connections that are the backbone of the URI. I commented on how interfaith changed in 1993, when we shifted from official spokesperson speaking to official spokesperson – exchanging only what their groups told them to say – to the modern focus on personal relationships and sharing personal stories. When we continue to interview only the “leaders” of the URI – who have tp represent all of us and so are constrained in what they can say – we continue the old paradigm. The heart-felt stories that ALL of the members have to share is what will really bind us together. • Audri Scott Williams ( ? / US) told us about walking around the world (literally) for peace as part of the Trail of Dreams CC (www.urimulti.org/index.php/cooperation-circles/multi-trail-of-dreams.html). • Deborah Moldow ( ? / US) told us about the activities of the URI at the UN CC, (www.digitaluniverse.net/uriun/) which coordinates a number of activities at the UN, including work with Deborah’s Peace Pole project (www.worldpeace.org/). We broke for lunch. Dr. Layne Little (Hindu / US) arrived. Layne is a member of the Spirituality & the Earth CC and is the Director of South Asian Projects for the Lost & Endangered Religions Project. I had asked Layne to come over to meet Biswadeb to discuss expanding LERP’s presence into north and east India. He and Biswadeb had a remarkable conversation about villages in east India with which Biswadeb works. These villages have a tradition of weaving palm fronds and leaves into plates of remarkably intricate design. Now, large companies have designed machines that can make the same plates faster and cheaper, and have destroyed the local economy in these villages. Not only does this hurt the villages economy, Biswadeb explained, but with the loss of this industry the villagers no longer go into the forest to gather the leaves, or tell the stories of how to relate to the forest spiritually, or share the experiences of relating to the forest animals, or sing the songs associated with this endeavor. Economic competition is destroying an indigenous spiritual way of relating to nature. This is right up LERP’s alley and we look forward to working out a way to help. • Sarah Talcott (Christian Science / US) and Matthew Youde told us about the URI Global Youth CC (www.uri.org/community/node/490) and the People for Peace CC and their conferences bringing together youth from around the Middle East to learn how to be peacemakers and facilitate non-violent communication. • Anne Roth (Christian / US) told us the story of the URI Council for Women CC (www.urimulti.org/index.php/cooperation-circles/multi-uri-council-women.html) and shared their proposal for a new URI Nuclear Disarmament MCC. • Elana Rozenman (Jewish / Israel) explained how the Women’s Interfaith Network of the URI (WIN URI) (www.urimulti.org/index.php/cooperation-circles/multi-win-uri.html) is a network similar to the Spirituality & the Earth CC. • Yoland said that the Women & Spirituality CC (www.urimulti.org/index.php/cooperation-circles/multi-women-spirituality.html) has been involved in ensuring the presence of women at the Indigenous Forum at the United Nations. Monica Willard (Christian / US) is the URI’s official representative at the United Nations. She has been very involved with the UN’s International Day of Peace, September 21st of each year. She told us the long, convoluted history of the Day, and said how much the UN notices and appreciates the attention that the URI pays to observing this Day. I was having health issues with my injured arm and hand, so I went off to take meds and relax for a bit. I missed workshops on “Peace, Media, and Public Relations” and “Nonviolence Education and Communications”. When I returned, the URI’s new COO Debra Bernstein was introducing herself and giving a report on the “State of the URI”. We have almost 500 Cooperation Circles in over 70 countries, involving over 1 million people. Dinner was followed by some light-hearted evening fare, including a puppet show / play by Rachael, Heng Sure, and PK. 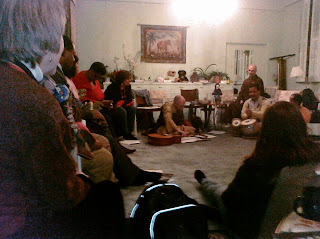 Guitar and Indian tabla music from Heng Sure and Biswadeb. Stories from all. And a song from “Showboat” by Deborah Moldow. Lance closed us out with humorous anecdotes from his Everest climb. It’s 1:00am and I’m keeping Rachael up. More tomorrow. Rachael Watcher and I are at the Regional Assembly of the Multiregion of the United Religions Initiative (www.URImulti.org). The URI’s member groups – Cooperation Circles or “CCs” – are organized into Regions. Seven are geographic: Africa; Asia; Europe; Latin America & the Caribbean; the Middle East & North Africa; North America; Southeast Asia & the Pacific. The eighth Region – the Multiregion – is for those CCs whose members are in more than one Region or that have a purpose that is broader than one Region. The Multiregion has always been the odd man out at URI meetings because whenever we break up to meet by Regions, folks usually go to the Region where they physically reside, leaving the Multiregional meeting virtually empty. “Virtual” has been the key word here. More than any other Region, the Multiregion has relied on email and Skype to stay connected. This is the FIRST Multiregion Regional Assembly -- i.e. face-to-face meeting -- even though the URI is 10 years old. We are at Anubhuti, a Meditation and Retreat Center run by the Brahma Kumaris in Marin, just north of San Francisco (www.anubhutiretreatcenter.org). The site is lovely and great for a small meeting. There are about 20 people here, representing 15 CCs from around the world, including: A Circle of Healers; Spirituality and the Earth; Everest Peace Project; Expressing the URI thru Music & Arts; the URI Office at the United Nations (We are an EcoSoc NGO at the UN. ); Think Peace Media; The Pilgrimage Project; WIN URI (Women in Network); and URI Global Youth. Today was mostly focused on recovering from jet lag, reconnecting with old friends, catching up, and sharing a sacred opening out on the terrace. Mussie Hailu is here from Ethiopia – He’s the guy who told me the Tabibe story that appears earlier in this blog. Biswadeb Chakraborty is here from India – The Director of South Asian projects for my Lost & Endangered Religions Project will join us tomorrow to talk with Biswadeb about expanding our projects into north India. Monica Willard is here from New York – She’s our representative at the UN. Elana Rozenman is here from Jerusalem – She brings optimistic news about peace efforts in the Middle East. The opening welcome was led by Yoland Trevino, an indigenous Mayan woman who is the Chair of the URI’s Global Council (which in itself says volumes about the URI), and the Rev. Canon Charles Gibbs, the URI’s Executive Director. They both spoke about the importance of doing interfaith work. What we all share, Charles said, is the awareness that life is a gift and we respond to that gift by giving back in the form of service.